Frustration Grows Along With The Number of TV Streaming Services It can be frustrating when viewers try to figure out which service has what they want to watch — Netflix, Prime, Hulu? It's about to get worse as more streaming services launch this year. 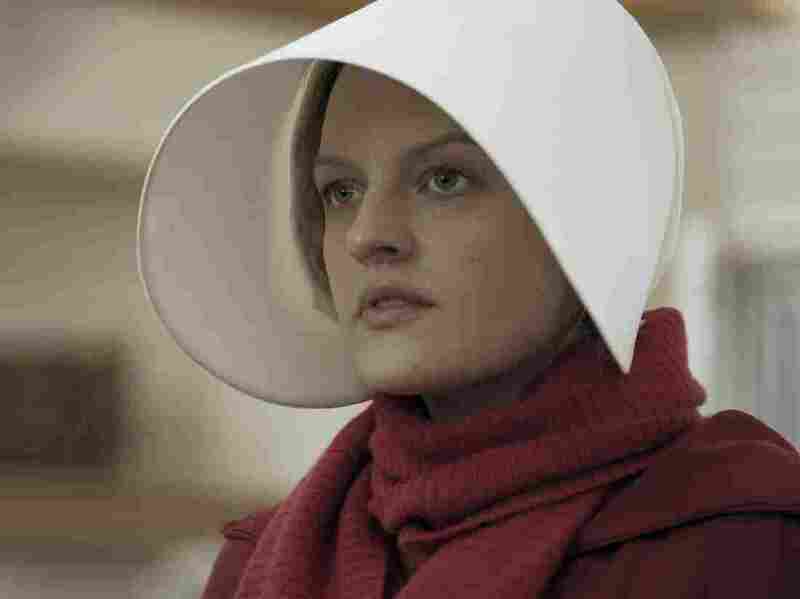 The Handmaid's Tale, starring Elisabeth Moss, coincided with a spike in new subscribers to Hulu, one of an increasing number of video streaming platforms. It has already been frustrating and costly for Brandon Smith. He's a big James Bond fan. Many of the films are online. Recently, he went back to finish watching one he had started on Hulu only to realize, "Oh, shoot! It's the 1st of the month. It's not available anymore." On March 1, Hulu lost the rights to several Bond films. Different ones will be there on April 1. "It seems to be a much more limited run of some of the content that I like," Smith says. The world has certainly changed since the days when the only option for consumers was to purchase a bundle of channels from a local cable, satellite or telco company. More than 70 percent of Americans households still have some kind of pay TV, according to eMarketer. But close to 60 percent now have at least one streaming service. And nearly half of consumers surveyed by Deloitte said they were frustrated by the growing number of subscriptions and services needed to watch what they want. People who want to see a new program have no choice but to subscribe. Hulu's original The Handmaid's Tale coincided with a spike in new subscribers. Game of Thrones appears to have given HBO's streaming service a boost. But the costs can add up. Smith, his wife and their two children have accounts with Netflix and Hulu. They also pay for Amazon Prime, cable and broadband at a cost of nearly $340 a month. "So far I'm able to absorb the cost," Smith says. "But I still would like to find one service that offers the stations [his wife] likes. So, it's just sort of finding that right mix that offers everything we're looking for." Unfortunately for Smith, that service may not be coming any time soon. "Some people have this notion and this misbelief that, 'Hey, one day someone's going to come along like Apple and they're just going to aggregate everything into one platform,' " says Dan Rayburn, a principal analyst with Frost and Sullivan. More streaming services are launching later this year, including one from Disney with all its entertainment might and hits from Marvel, Star Wars and Pixar, and AT&T, which owns Time Warner and the rights to Harry Potter. "These major corporations like a Disney, they want to have the direct-to-consumer relationship," Rayburn says. "They don't want to go through a third party. They don't want to go through another platform." Amanda Lotz, a professor at Queensland University of Technology in Australia, thinks it's a golden age. "In one household you may decide that you need these services, in the next household they may be entirely different," she says. "There is that element of choice. There is the ability to add and drop the services much more fluidly than was the case with something like cable." Lotz says customers are experimenting, too. Many subscribe to a service to watch one particular show and cancel the subscription when it's over. Sometimes they can just buy a show a la carte. Some experts don't think this hodgepodge of services will last. Mark Suster, a venture capitalist who has been investing in online video for over a decade, thinks we're in one of those moments of explosive growth — like the early days of the Internet — when a lot of companies are fighting it out for dominance. Over the next few years Suster believes many services will spend a lot on content to woo customers. "And after they realize that they're not winning the race, you'll see a lot of those people exit and consolidate around the winners," he says. Some people might actually welcome consolidation. Alexa Conway is a 70-year-old retiree on a fixed income. She has Netflix, Amazon Prime and Hulu, but canceled her cable subscription to save money, and she put up an antenna to get local TV stations. She's a fan of the Denver Broncos. On cable she got all their games. She says now she would have to subscribe to the CBS All Access streaming service to watch them all. "And it really, really offended me," she says. "I just thought — 'You know, there's enough to do if I want to sit in front of the TV and binge that I don't need to pay yet another service.' "
The kind of anger Conway is feeling may be having an unexpected impact. For the first time in many years, there's growth in online piracy of film and TV. Some experts say it may be because fans are getting sick of paying for yet another streaming service.